The God of Thunder goes on a cosmic adventure in an attempt to save Asgard from an Apocalyptic threat in Taika Waititi’s Thor: Ragnarok. There’s a recurring criticism that comes out when people talk about Marvel Movies. It is often said that the films all follow a slavish house style that doesn’t allow the individual talents of the Director to shine through. While I believe that to be true in some cases there are plenty of Marvel Cinematic Universe movies that carry a directorial stamp that makes them unique. Guardians of the Galaxy and Guardians of the Galaxy Volume 2 are obvious examples but films like Iron Man 3 and arguably both Avengers films carry the signatures of those who make them. That opening statement was a long winded way for me to say that Thor: Ragnarok is a film that unquestionably and unashamedly carries the stamp of its Director. 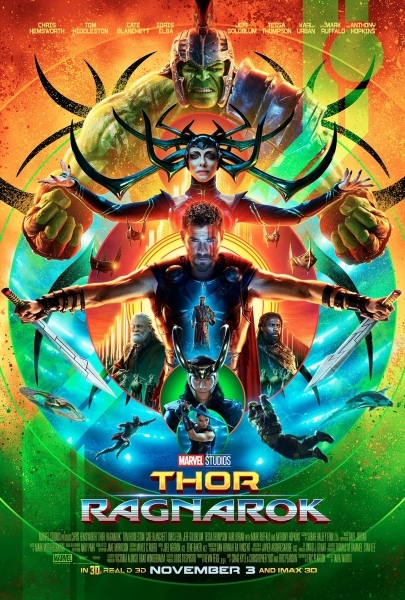 Taika Waititi’s fingerprints are all over this film and it’s definitely a better film as a result. Waititi’s last film Hunt for the Wilderpeople was one of the best films of 2016 so I’m glad to see that corporate film making hasn’t dulled his unique voice in any way. From the opening seconds it’s obvious what sort of film this is going to be. It opens on a series of jokes leading into a really impressive action sequence that also has jokes peppered throughout while maintaining a level of tension and jeopardy that prevent the sequence feeling like something that shouldn’t be taken seriously. Striking a balance is something this film does very well. It’s funny without being a farce, dramatic when it needs to be and always keeps the characters at the centre of everything. At its heart it’s an adventure story and the adventure is completely informed by the characters and their motivations. Thor has fallen on hard times after having his hammer destroyed and finding himself exiled from Asgard onto an unknown alien planet where Gladitorial Combat is the primary means of entertainment. The entirety of Thor’s focus is returning to Asgard to save his people and to do that he has to find a way to escape his surroundings. The character of Thor has changed a great deal since he was last seen in Avengers: Age of Ultron. In prior outings he was a hyper serious character always talking about how dire the peril is and hitting things with his hammer while delivering grandiose speeches about how great he is. Some of that is still there but he’s a much lighter presence than he ever has been. His arrogance is still there but he is far less uptight which makes him a far more endearing lead than he ever has been. This is a version of Thor that Chris Hemsworth can clearly sink his teeth into as a performer and it’s clearly something he had a blast with. It seems that Thor has learned humility since his last appearance which is curious considering that was supposed to be his arc in the first film. Mark Ruffalo makes a return appearance as Bruce Banner aka the Hulk and he has also changed a lot. Banner as a character is much less tortured and more overwhelmed by the situation he’s in. As with everything it is played for laughs but there’s the hint of tragedy beneath the surface with the suggestion that one more transformation into the Hulk will be the end of Banner forever. Sadly this is somewhat swept under the carpet and largely ignored. In his Hulk persona he has more personality than ever and is now allowed to have actual conversations with other characters which is personally something I have wanted for a long time. Other returning characters such as Loki (Tom Hiddleston) and Heimdall (Idris Elba) are welcome additions. Hiddleston’s Loki is a fan favourite character and the character delivers what you would expect of him while still managing to have meaningful brotherly scenes with Thor that remain consistent from their previous encounters. Elba’s Heimdall is the best he has been in any of the films and has a very important purpose in the film. Anthony Hopkins’ Odin has a part to play that somewhat completes Thor’s arc that started in the first film and there’s a very brief cameo from Benedict Cumberbatch’s Doctor Stephen Strange that moves the plot forward somewhat though wouldn’t necessarily have been missed had it not been there. Newcomer Valkyrie (Tessa Thompson) is a great addition to the cast. Valkyrie has something of a redemptive arc and fits the tone of the film perfectly. Tessa Thompson is an immensely talented actress and I hope this isn’t the last that is seen of this character. Karl Urban also has an impressive turn as an opportunistic coward named Skurge who appears throughout the film in a role that’s clearly defined yet engaging. Karl Urban definitely elevates this character beyond something that could easily have been bland. The same can be said for Jeff Goldblum’s Grandmaster who would be thin on the page but add Jeff Goldblum to anything and a wonderfully eccentric ball of insanity comes out the other end. He’s always welcome in anything and makes for a wonderful addition to the cast. There are other characters such as director Taika Waititi’s Kor who is good comedic value throughout. Too much of him would have started to grate but he’s deployed strategically and the contrast between his voice and the design of the character is a near endless source of comedy. Cate Blanchett’s Hela works really well as a villain though suffers from something of a lack of screen time. The only imbalance the film has is spending a little too much time with Thor and not enough time establishing the threat that Hela represents. She is still threatening thanks to Blanchett’s incredible screen presence. As villains go she is far from Marvel’s worst with a believable threat level and motivation that makes sense even if the implications of her backstory aren’t as developed as they could be. As with all Marvel films the action is incredibly well put together. Thor’s title fight with the Hulk is a particular highlight as it takes advantage of the shared history between these characters and the climactic battle in Asgard is also very impressive. Action in a film like this runs the risk of being disposable but the stakes are always clearly established, the characters remain the focus and there’s emotional heft to each of them. Characters fight for their own reasons in this film and it makes it all the more engaging to watch. The tone won’t be for everyone but I had a great time with it. As the film progressed the gags became very predictable as the style delivering a punchline at the end of a tense scene was repeated but there was rarely a point where the joke didn’t land and most of the interactions -even dramatic ones- had comedy at the root of them. The pacing was also expertly handled no sense of drag to the plot. There’s a lot of fun to be had with Thor: Ragnarok. It strikes a near perfect balance between comedy, action and meaningful characterisation. Chris Hemsworth feels more secure in his character than ever with welcome alterations made to the character and the rest of the cast blend into the narrative wonderfully. The film drops the ball slightly on developing the villain’s motivations though it was barely noticeable and there was the hint of a tragic aspect to Bruce Banner’s role in the film but it was largely swept aside. It’s a hilarious film, very well paced and contains some expertly crafted action sequences that use the characters involved to inform them.